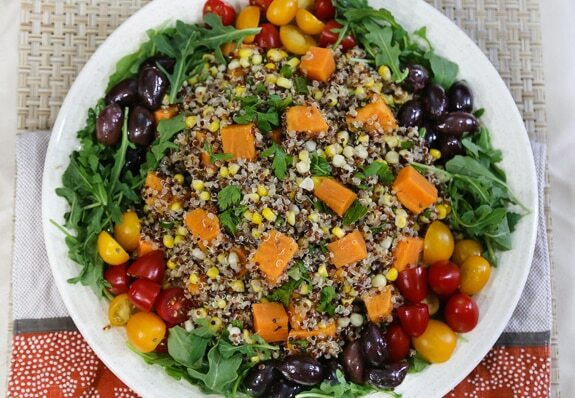 This colorful main dish salad featuring sweet potato, quinoa, and corn is simple to prepare, yet has a festive “company’s coming” look. It makes a bountiful accompaniment to vegan quesadillas. 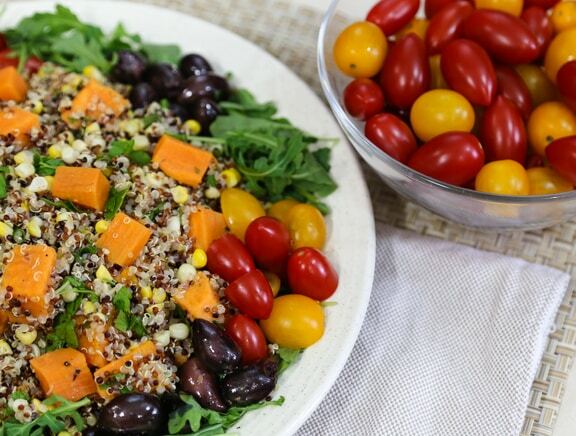 If you can cook the sweet potatoes and quinoa ahead of time, this will come together in a flash when you want to serve it. Photos by Evan Atlas. Scrub or peel the sweet potatoes and cut into 3/4-inch chunks. Place in a large saucepan with about an inch of water. Cover and steam over medium heat, stirring occasionally, until done but still firm, about 8 to 10 minutes. Allow to cool. In a mixing bowl, combine the cooked and cooled sweet potatoes with the corn, scallions, scallions, and parsley or cilantro. Drizzle in enough dressing to moisten, followed by the lime juice. Season gently with salt, and generously with pepper. Taste and see if you’d like to add more dressing, lime juice, or even any more fresh herbs. Line a large serving platter with arugula or greens. 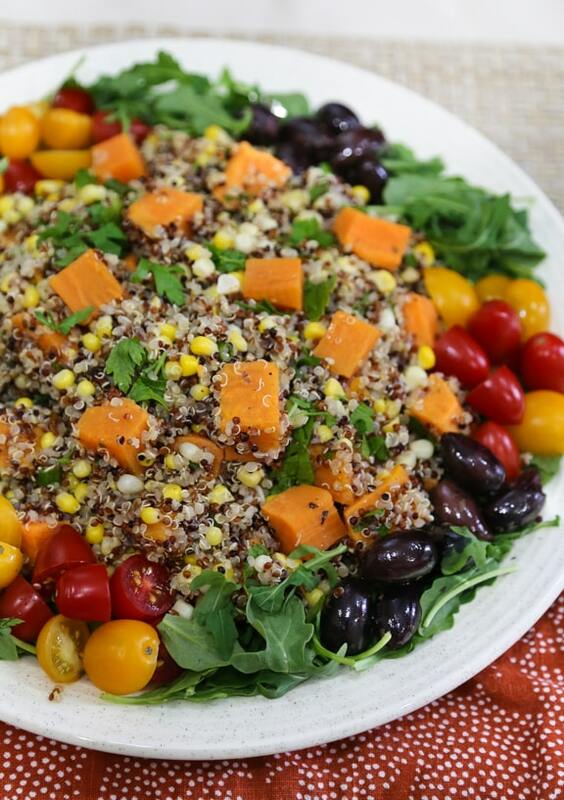 Mound the quinoa-sweet potato mixture over it, leaving some room along the periphery of the platter. Arrange alternating sections of olives and tomatoes around the edges of the platter. Have everyone make their own mini-composition from these ingredients on individual plates.